This needs to be reorganized! But, still some good stuff here. 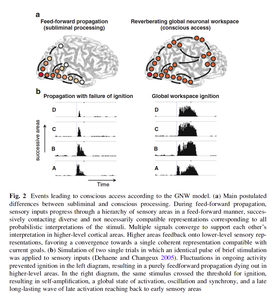 . .
1 ) Preconditions: Arousal and Vigilance, 2 ) Gray Matter, White Matter and the Thalmus, 3 ) Brain Regions, 4 ) Long Distance Networks in the Brain, 5 ) The Subconscious Elephant, 6 ) Novelty and Global Ignition, 7 ) Cortico-Thalamic Complex, 8 ) Adaptive Resonance and Binding, 9 ) Coalitions of Neurons, 10 ) Keeping a Thought in Mind, 11 ) Broadcasting and Recruiting, 12 ) Limited Capacity of Consciousness, 13 ) Sensory Percepts vs. Feelings of Knowing, 14 ) Spatiotopic Activity Maps, 15 ) Feelings of Knowing, Concepts and the Tip of the Tongue, 16 ) Microstates and the Stream of Consciousness, 17 ) Self - just throwing this in. 1) common sense - our inner mental life while awake. 2) behavioral - a checklist of actions or behaviors we use to certify consciousness, for example, the Glasgow Coma Scale. We do not need to define consciousness to explore the miracle that is the human brain. We do not need to define consciousness to explore what the role of emotions is within our experience. See Dehaene's What is Consciousness Good For? Consciousness only happens when you are conscious. Arousal is the state of being awake as governed by the Reticular_Activating_System (RAS). Consciousness implies you can pay Attention to this or that. Vigilance is sustained concentration. "There are many different neural systems involved in what is collectively known as the arousal system. Five major systems originating in the brainstem, with connections extending throughout the cortex, are based on the brain's neurotransmitters, acetylcholine, norepinephrine, dopamine, histamine, and serotonin." 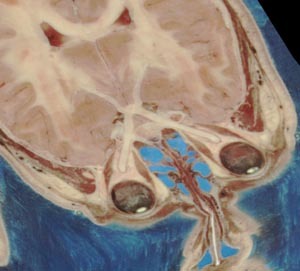 The brain is composed of different tissue types. Three that are critical for understanding the conceptual framework here in. The neocortex is gray matter. The myelinated long axons are the white matter. 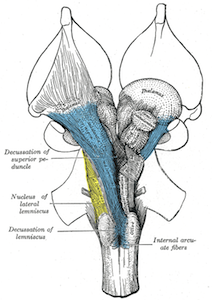 The thalamus has a gazillion nuclei and tissue types. Gray matter is the neocortex. It is a 2D manifold of six layers of neurons and supporting glial cells. It should be thought of as a large (30cm+/-) pancake that is folded in on itself. 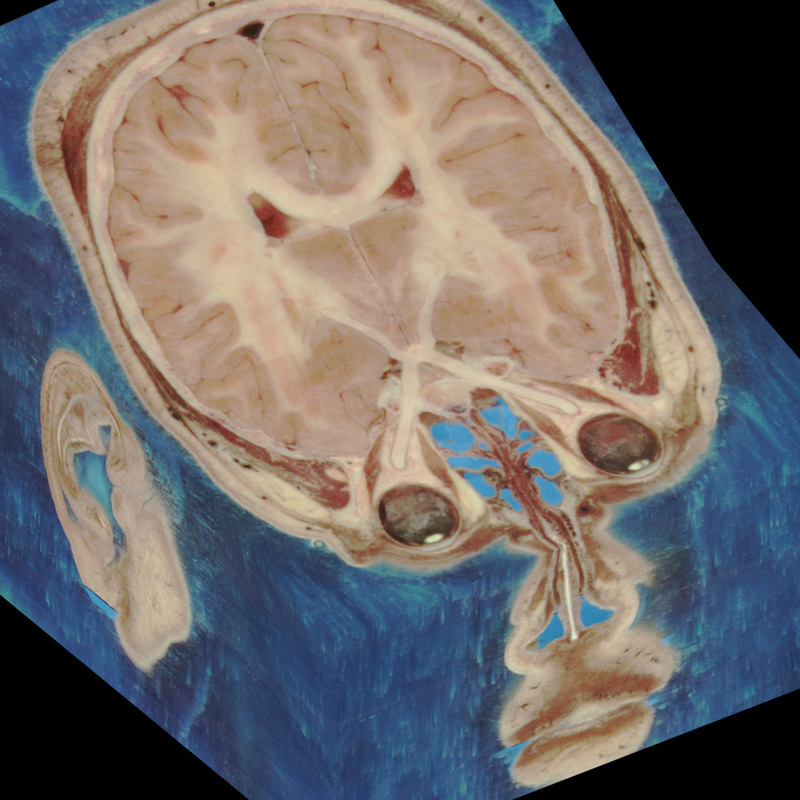 The big sections are called lobes, the second level of folding size is called a gyrus, as in the cingulate gyrus. The division between folds is called a gyrus, plural - gyri. The gray matter is organized into cortical columns, each about 0.5mm square. Each column has a long axon, which is a long branch of the nerve cell that transmits information to another set of neurons. Within the gray matter there are several types of neurons: pyramid, mirror, . . .
White matter consists of the long efferent (output) axons that are myelinated. Myelin is a white fatty material that forms a sheath around the axon to protect signal integrity. The myelin and axons are too small for us to scan at this time. We can create images of the pathways of the axons using Diffusion Tensor Imaging (DTI). Forest Metaphor for Neocortex: Imagine the neocortex is forest of tall oak trees. The canopy is 6 layers deep and the tree trunk is an axon that runs out of this column to spread its news. The leaves and branches are sharing information with all of the trees in the neighborhood. And some news is carried in from afar. The axon leaving the tree trunk does not split in the roots right away. It travels to some other region of the forest, or perhaps into central intelligence - the thalamus. If the efferent (axon leaving) is heading to another region of the forest, then by this metaphor, the roots would spring out of the ground and the roots would send out dendrites that would eventually meet the other trees leaves and branches at synapses. None of the recent books I have read discusses columns. Too fine grain? Nothing I've read disproves the Cortical Algorithm. 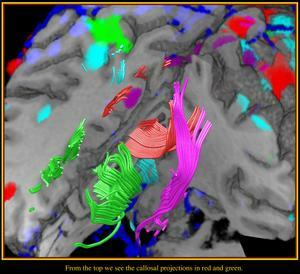 To the right is an image from the Brain Explorer from the Allen Institute for Brain Science. The green shape in the middle is the thalamus, which consists of many, many nuclei. 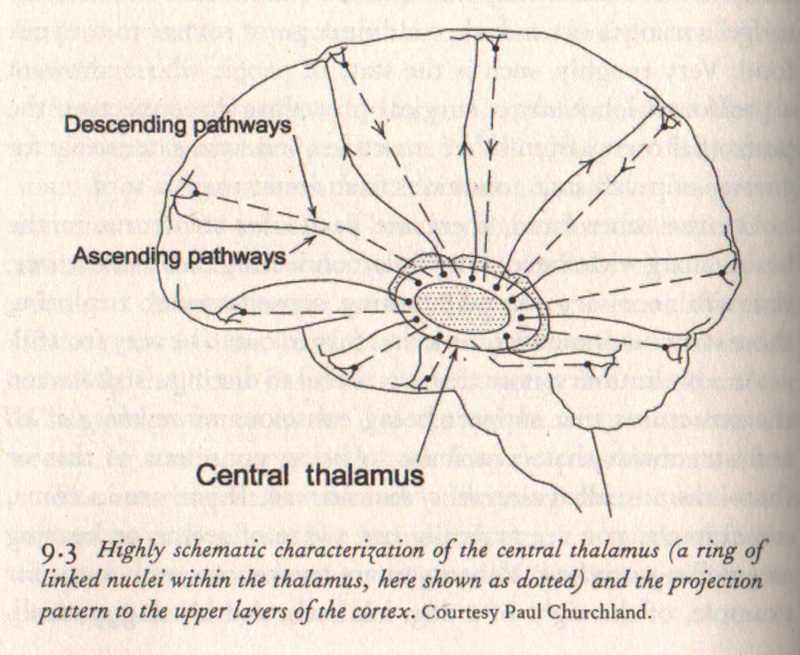 The central thalamus has matching nuclei for each brain region. The brain has hundreds of little special purpose processors. Different regions in the neocortex and nuclei of the thalamus and the basal ganglia and . . . There are 4 different ways we know about brain regions. FACT - Functional, Architecture, Connectivity, Topography. We can say what the functional areas are from brain lesions and fMRI. Architecture, or Cytoarchitecture is the structure of the 6 layers and the types of neurons in a region. Connectivity is where the wires run from this region. Topography is where it is physically in the brain. In 1861, Paul Broca identified a lesion on a specific brain region destroyed a person's ability to speak, but left all other brain functions intact. That area is now known as Broca's area. Soon, Wernicke's_area was identified. There are countless fascinating (and tragic) stories of Prosopagnosia, Motion_blindness, Blindsight to name a few. 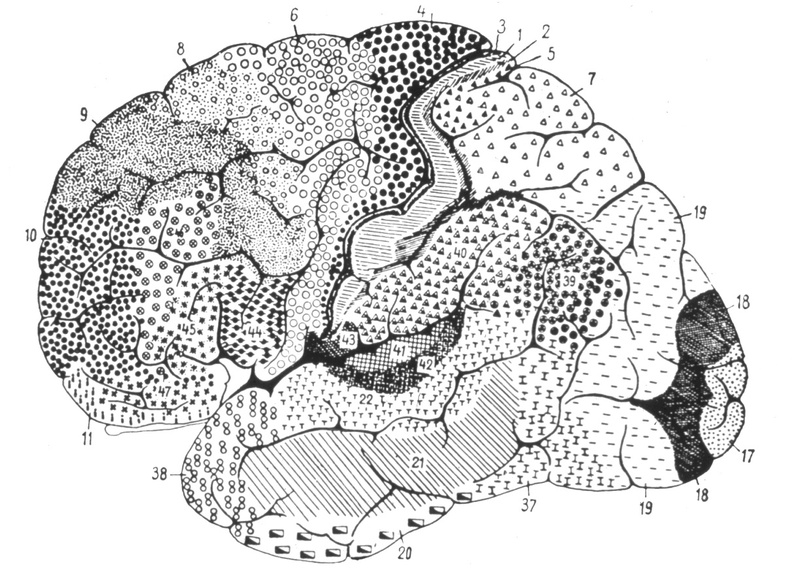 In 1909, Korbinian_Brodmann published his maps of cortical areas based on Cytoarchitecture, the physicological differences in the cell structure of different regions of the neocortex. more. The largest area the V1, the primary visual cortex. - different to parcellate brain regions. How many parcels are there? Mouse has 40 areas. Vagus Nerve We need to be safe for the Cortex to have any hope of influencing behavior. 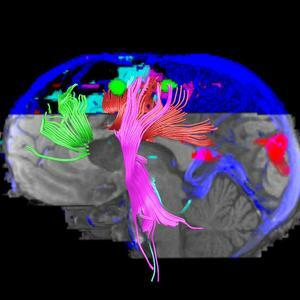 Long distance axons link different brain regions. 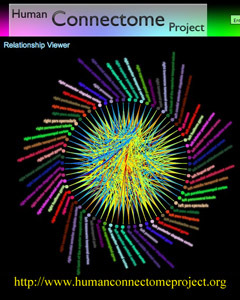 Image to right is from the HCP Relationship Viewer. It is INTERACTIVE! ! ! 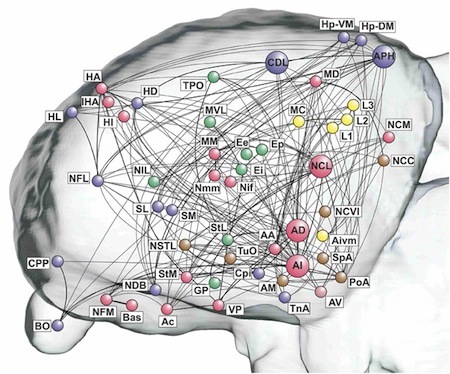 Human Connectome Project is devoted to these networks. 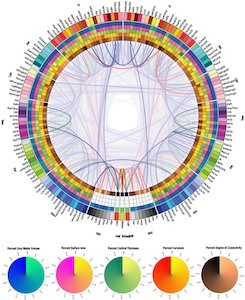 Andrei Irimia did a similar visualization for Humans. Not this is the dominant way to look at networks, IHMO. Recent experiments in psychology and brain imaging have tracked the fate of unconscious pictures in the brain. We recognize and categorize masked images unconsciously and we even decipher and interpret unseen words. Subliminal pictures trigger motivations and rewards in us all without our awareness. Even complex operations linking perception to action can unfold covertly, demonstrating how frequently we rely on an unconscious "automatic pilot." Oblivious to this boiling hodgepodge of unconscious processes, we constantly overestimate the power of our consciousness in making decisions-but in truth, our capacity for conscious control is limited. Dehaene's main avenue of investigation is monitoring brain activity of subliminal stimuli and gradually increasing it until it becomes conscious. See Novelty and Global Ignition. 2) Zombie Agents handle much of our actions. Anything we do unconsciously, things we train for. Things handled by the Dorsal pathways & "gist perception"
Consciousness handles the exceptions (See Hawkins) and it presents an executive summary to the planning stages. 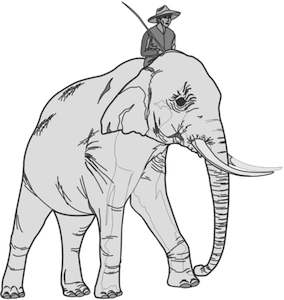 To understand my own personal consciousness, I find Haidt's The Elephant And The Rider Metaphor extremely useful. The subliminal self is in no way inferior to the conscious self; it is not purely automatic; it is capable of discernment; it has tact, delicacy; it knows how to choose, to divine. What do I say? It knows better how to divine than the conscious self, since it succeeds where that has failed. In a word, is not the subliminal self superior to the conscious self? Daniel Kahneman's Thinking, Fast and Slow is about the fast automatic subconscious and the slow conscious thinking. Very useful for understanding one's self. The subconscious deals nicely with the routine. Novelty ignites the global workspace that hijacks the rider. 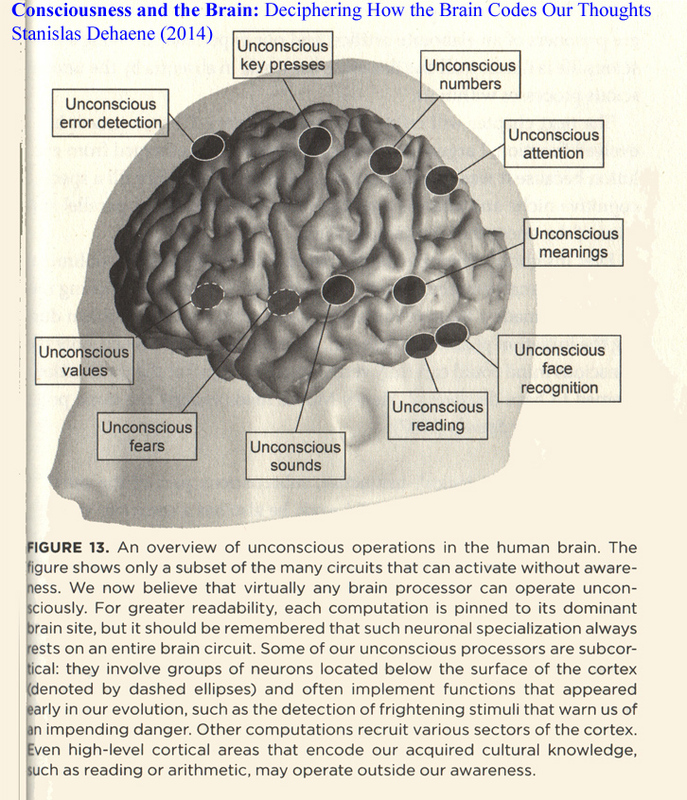 Dehaene uses the term Signatures of Consciousness, an upgrade from correlates of consciousness found in Christof Koch's The Quest for Consciousness. I would not say these are really signatures of consciousness, but rather signatures that new stimuli have entered consciousness - have made it into the Global Workspace. We retain whatever is conscious without the constant refresh of these signatures. Here are the . . .
p. 159 - "four reliable signatures of consciousness - physiological markers that index whether the participant experienced a conscious percept. First, a conscious stimulus causes an intense neuronal activation that leads to a sudden ignition of parietal and prefrontal circuits. Second, in the EEG, conscious access is accompanied by a slow wave called the P3 wave, which emerges as late as one-third of a second after the stimulus. Third, conscious ignition also triggers a late and sudden burst of high-frequency oscillations. Finally, many regions exchange bidirectional and synchronized messages over long distances in the cortex, thus forming a global brain web. An avalanche is also used as a metaphor for ignition. The subliminal rumble of neural activity is almost identical to the supraliminal. Just a little bit strong stimulus triggers and avalanche that gets a new precept into the Global Workspace." The Cortico-Thalamic Complex is a network of connections between all brain regions that loops through the Thalamus. 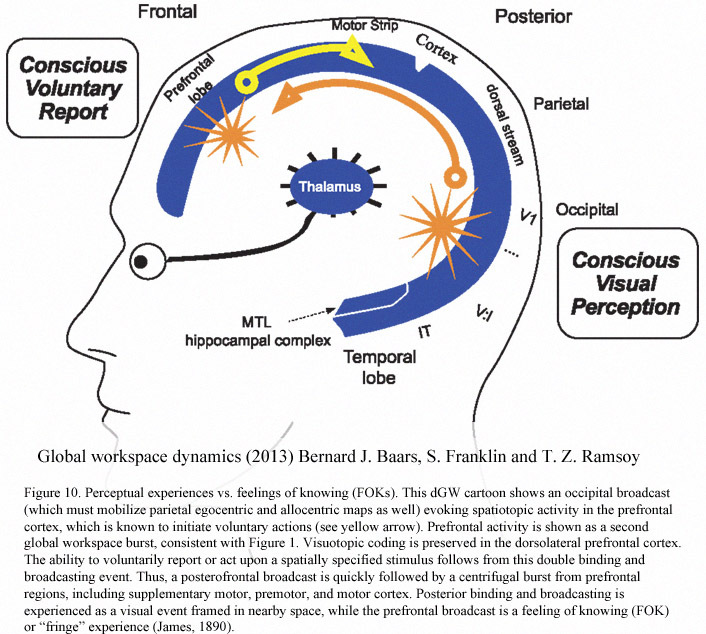 Baars 2013 Summary: 3) "In humans the C-T complex underlies reportable conscious percepts, concepts, FOK, visual images and executive functions. 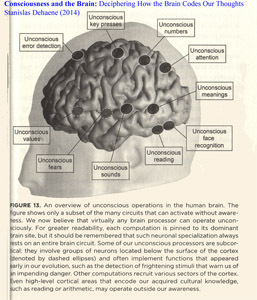 While subcortical areas are often sometimes proposed to specify conscious contents, the human evidence is slight and disputed. Because cortex and thalamus are interleaved so densely as to constitute a single functional system, we will refer here to the C-T system as a whole. C-T pathways permit constant reentrant signaling, so that multiple spatiotopic maps can sustain or inhibit each other. The daily states of the core are controlled by basal brain nuclei." The proposal is simple: consciousness is brain-wide information sharing. The human brain has developed efficient long-distance networks, particularly in the prefrontal cortex, to select relevant information and disseminate it throughout the brain. Consciousness is an evolved device that allows us to attend to a piece of information and keep it active within this broadcasting system. Once the information is conscious, it can be flexibly routed to other areas according to our current goals. Thus we can name it, evaluate it, memorize it, or use it to plan the future. Computer simulations of neural networks show that the global neuronal workspace hypothesis generates precisely the signatures that we see in experimental brain recordings. It can also explain why vast amounts of knowledge remain inaccessible to our consciousness. 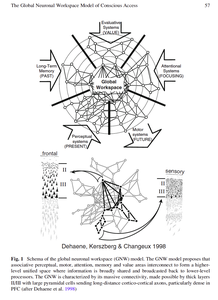 Churchland has a concise description of Global Workspace Theory. 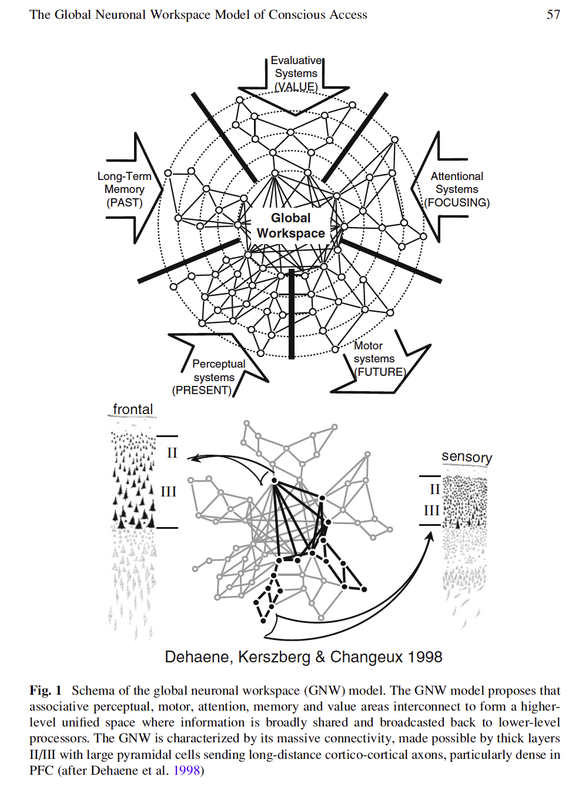 YON's turn: The Global Workspace (GW) is a functional hub of connections between all brain regions using a network of long distance axons that loop through the Thalamus. The dynamic capacity for binding and propagation of signals within the system allows for coalitions of neurons to connect different brain regions to form conscious percepts. Multiple coalitions exist at a pre-conscious level and compete for dominance. The succession of winning neural coalitions forms our stream of consciousness. Loops within the CT complex synchronize. Fire together; wire together. 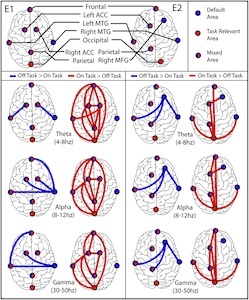 Using MEG, we can tell that two brain regions are synchronized. The image to right is from Kirschner 2012 Differential synchronization in default and task-specific networks of the human brain. Baars 2013: Since “binding” and “broadcasting” involve adaptive resonance, the distinctive type of signaling in the C-T core, dGW suggests “binding resonance” to define the winner-take-all gestalt that becomes conscious and “broadcasting resonance” to propagate the winning gestalt to receiving networks. Koch 10 Assumption (2004) 9) synchrony of action potentials discharge in the 30-60Hz range may help in forming nascent coalitions. Firing in the 4-12 Hz band may be part of snapshot processing. Dehaene p.135 - "The bestiary of brain oscillations includes the alpha band (8 to 13 hertz), the beta band (13 to 30 hertz), and the gamma band (30 hertz and higher) [jch - hertz is per second. 8 hertz means a pulse every 1/8 second]"
Wikipedia: Neural Oscillation, Neural Binding. The image is actually from a pigeon, but, until I have a better image, it is fun. It is not really a coalition, but the full connectome. Here is the paper. The dominant coalition broadcasts its idea throughout out the brain and other regions can add new data if they have it. Only one coalition is dominant at any one point, but, coalitions may cycle. 3) consciousness has limited capacity. Only 1 conversation, no long division while spotting of eddies. Dominant coalitions come from the senses or from the prefrontal cortex or perhaps combinations of the above. Perhaps you are thinking of aunt Robin and a picture of a tennis racket you usually pass over in a familiar way pops out at you. 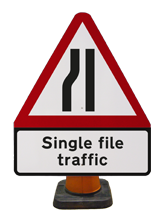 Figure 10. Perceptual experiences vs. feelings of knowing (FOKs). 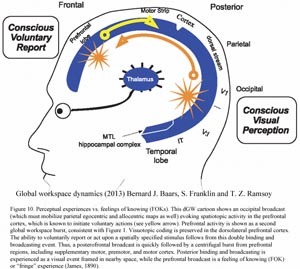 This dGW cartoon shows an occipital broadcast (which must mobilize parietal egocentric and allocentric maps as well) evoking spatiotopic activity in the prefrontal cortex, which is known to initiate voluntary actions (see yellow arrow). Prefrontal activity is shown as a second global workspace burst, consistent with Figure 1. 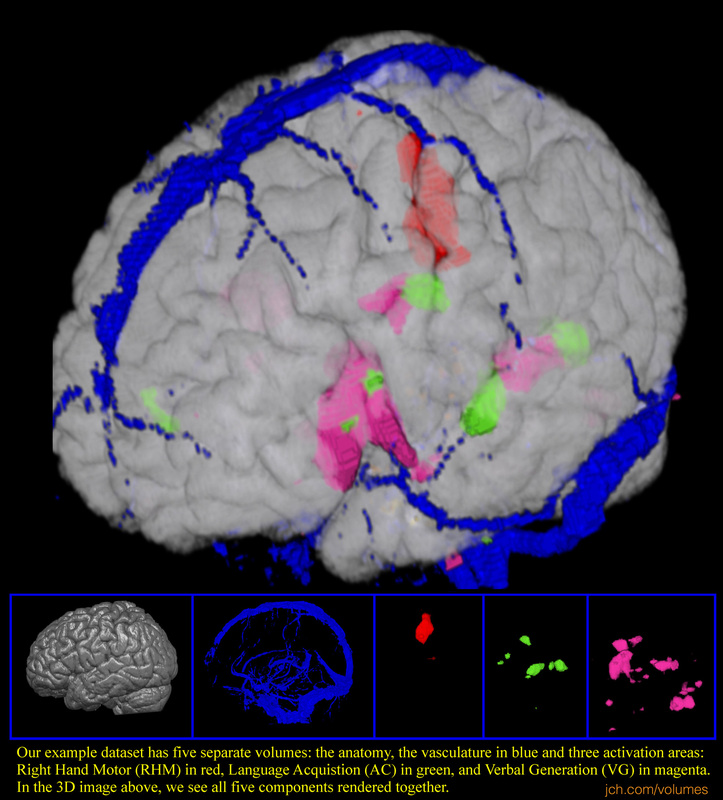 Visuotopic coding is preserved in the dorsolateral prefrontal cortex. The ability to voluntarily report or act upon a spatially specified stimulus follows from this double binding and broadcasting event. Thus, a posterofrontal broadcast is quickly followed by a centrifugal burst from prefrontal regions, including supplementary motor, premotor, and motor cortex. 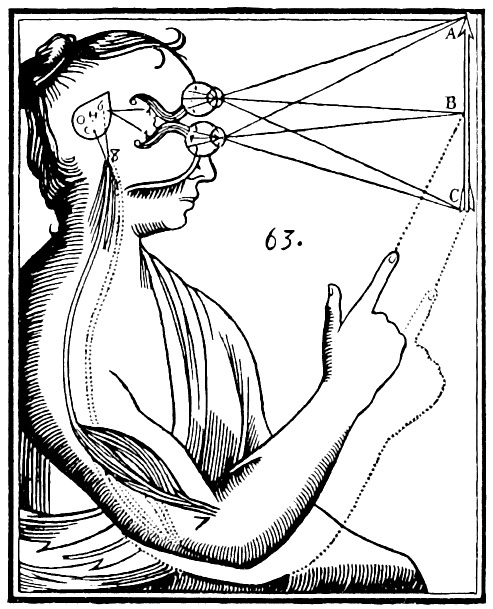 Posterior binding and broadcasting is experienced as a visual event framed in nearby space, while the prefrontal broadcast is a feeling of knowing (FOK) or “fringe” experience (James, 1890). Researchers have described two different aspects of how the mind comes to attend to items present in the environment. Consciousness and Attention: on sufficiency and necessity talks about when attention and consciousness are not the same thing. We have 20-40 copies of what we are looking at with different bits of information, such as color, motion, object identification . . . This chapter from the Webvision Book, Psychophysics of Vision, by Michael Kalloniatis and Charles Luuhas, is a great overview of the visual system. Collin Ware has a wonderful simple description of the various parts of the visual cortex and how they can be exploited. The the right is an image of the optic nerve, the Optic_chiasm, and, perhaps the LGN. 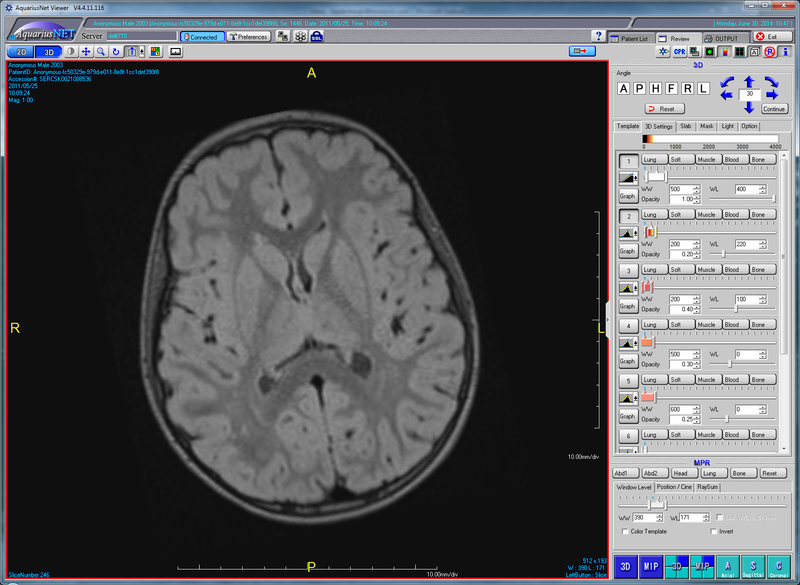 This image is the RGBA dataset from the Visible Human project being rendered on a VP1000, aka VolumePro 1000. To the right, is a set of images representing the Multiple Retinotopic Maps of the Visual Field in which different attributes are encoded. Follow the link. Here is a gif animation. At the bottom of the page are some musings about Spatiotopic v. Retinotopic v. Visuotopic. You know that feeling that you know something, but you cannot access. . . Dominant coalitions are fleeting . . . Dynamic Global Workspace - . . "evidence for stable microstates in the EEG for both the rabbit and humans, exhibiting rapidly changing phase after ∼100–200 ms, the rate of theta oscillations (Freeman, 2007). Other laboratories, using quite different methods, have also reported momentarily stable, content-sensitive microstates. The current theory suggests that microstates represent binding and broadcasting equilibria involving dynamic coalitions of adaptively resonant populations of neurons. This view seems quite compatible with sophisticated theoretical work by Freeman and Kozma. Crick and Koch (2005) suggested the term "coalitions" for this general concept." Richard Schwartz's Parts Therapy has the Self as an organizing principle. The self is totally calm and has ample untapped energy. The official name of Parts Therapy is IFS, Internal Family Systems, which makes sense from how the model got articulated. Mindfulness Training and the default mode network.
" Mindfulness Training increases connectivity within the DMN "
1) Increased default mode network connectivity associated with meditation. 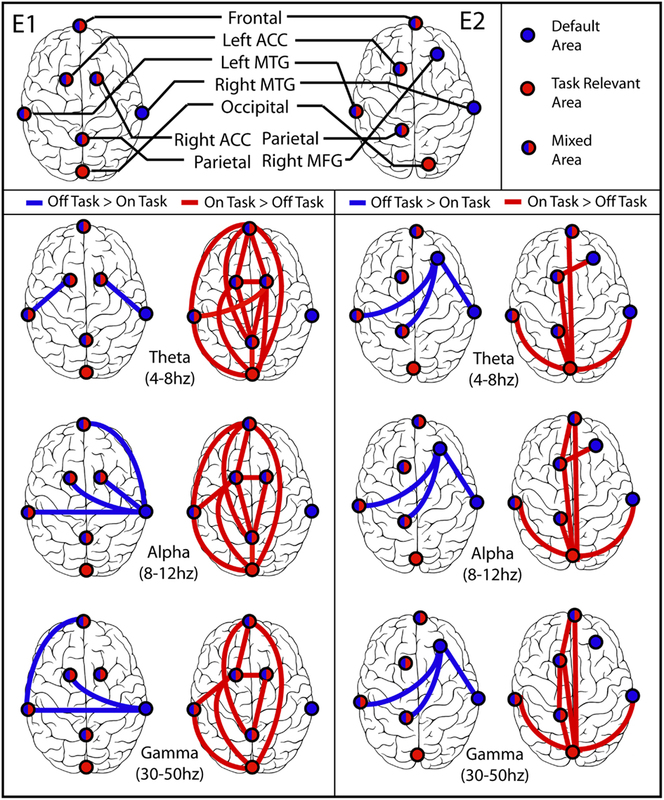 2) Impact of meditation training on the default mode network during a restful state. Helen Mayberg also talked about Deep Brain Stimulation for severely depressed patients, where an electrode implanted near the thalamus fires every 7 ms, and the depression lifts immediately. This struck me because "microstates" last about 10 milliseconds. They are the "atoms of thought" - the minimal time slice for a dominant coalition to hold the cortical thalamic complex. Conscious percepts are unitary and internally consistent at any given moment. The brain has many anatomical hubs, but This suggests that a brain-based GW capacity cannot be limited to only one anatomical hub. Rather, it should be sought in a dynamic and coherent binding capacity – a functional hub – for neural signaling over multiple networks. A number of findings are consistent with the theory. At the end of the book. It is hard to say which of the many assertions are actually the numbered assumptions, but who am I to quibble? 1A) Forward Projections are strong to the front of the cortex. Feedback modulates feed forward. 1)Nonconscious Homonunculus: We are not conscious of the highest levels of cognition. 4) Explicit representation of some stimulus is a set of neurons. Lose those and you no longer perceive that stimulus. 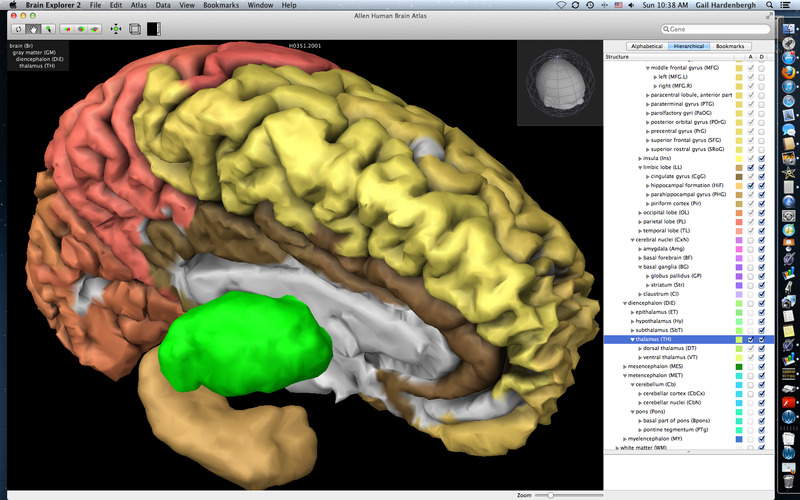 The cortex is a large set of nodes. A "column" is the smallest useful node. 6) Driving and modulatory loops: To understand coalitions we must understand the neural connections. Excitatory cells send driving or modulatory charges. From the back of the cortex to the front are mostly driving charges. Loops of driving charges are bad. 8A) Attention: There are two types of attention: a) bottom up saliency driven and b) top down and volitionally controlled. Bottom up would be a sensory net wave that breaks thru. For example, a ball flying at you. 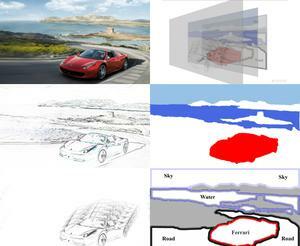 There is also "gist perception" which allows us to go thru the world on auto pilot. As long as nothing salient happens, we are not really conscious of a lot of our daily activities. Like when we drive home and remember no details of the drive. 9) synchrony of action potentials discharge in the 30-60Hz range may help in forming nascent coalitions. Firing in the 4-12 Hz band may be part of snapshot processing. 10) Winning coalitions recruit from the cortex, thalamus, basal ganglia and other networks. In addition to the neurons that are explicitly part of the NCC is the penumbra which includes past associations, background and future plans. The penumbra provides meaning or the potential for meaning which might only happen if the NCC expands to those nodes. 1) A GW is a functional hub of signal binding and propagation in a population of loosely coupled signaling agents. Neurons and neuronal cell assemblies can be defined as such agents when they respond selectively to input. 2) Conscious experiences may reflect a GW function in the brain. The brain has many anatomical hubs, but conscious percepts are unitary and internally consistent at any given moment. This suggests that a brain-based GW capacity cannot be limited to only one anatomical hub. Rather, it should be sought in a dynamic and coherent binding capacity – a functional hub – for neural signaling over multiple networks. A number of findings are consistent with the theory. 3) In humans the C-T complex underlies reportable conscious percepts, concepts, FOK, visual images and executive functions. 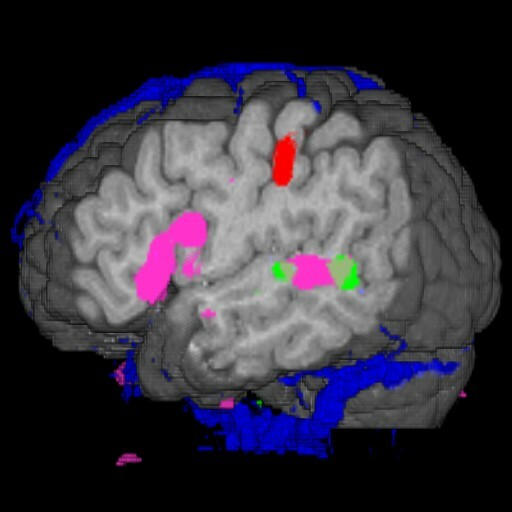 While subcortical areas are often sometimes proposed to specify conscious contents, the human evidence is slight and disputed. Because cortex and thalamus are interleaved so densely as to constitute a single functional system, we will refer here to the C-T system as a whole. C-T pathways permit constant reentrant signaling, so that multiple spatiotopic maps can sustain or inhibit each other. The daily states of the core are controlled by basal brain nuclei. 4) Global workspace theory follows the historic distinction between the “focus” of experience vs. the largely implicit background of experience. Extensive evidence shows that visual and auditory consciousness flows from the respective sensory cortices to frontoparietal regions. This directionality differentiates GW dynamics from information integration theory and dynamic core theory. 5) Cortico-thalamic core is a great mosaic of multi-layered two-dimensional neuronal arrays. Each array of cell bodies and neurites projects to others in topographically systematic ways. Since all C-T pathways are bidirectional, signaling is “adaptively resonant” (reentrant). In this complex, layered two-dimensional arrays are systematically mirrored between cortex and thalamus, region by region. 6) The C-T nexus appears to be the most parallel-interactive structure in the brain, allowing for efficient signal routing from any neuronal array to any other. This connectivity is different from other structures that do not directly enable conscious contents, like the cerebellum. The cerebellum is organized in modular clusters that can run independently of each other, in true parallel fashion. But in the C-T core any layered array of cortical or thalamic tissue can interact with any other, more like the world-wide web than a server farm. 7) Cortico-thalamic pathways run in all canonical directions and follow small-world organization, so that each array is efficiently linked to many others. The entire system acts as an oscillatory medium, with markedly different global regimes in conscious and unconscious states. 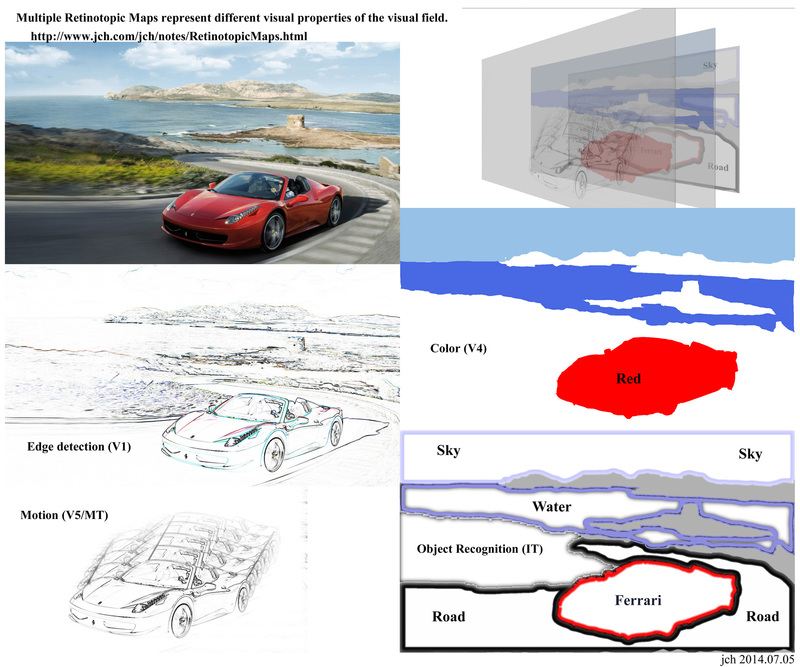 8) Global workspace dynamics interprets the traditional distinction between the “object” and “ground” of experiences as a directional flow between the moment-to-moment focus of conscious experience vs. the implicit background and sequelae of focal contents. The proposed directionality of broadcasting suggests a testable distinction with information integration theory and dynamic core theory. 9) For example, while sensory experiences are proposed to bind and broadcast from posterior cortex, “fringe conscious” FOK plausibly emerge from non-sensory cortices, and may therefore broadcast rostrocaudally. 10) Finally, dGW suggests the counter-intuitive idea that in intact humans, the MTL supports conscious episodes. The classic lesion case of HM seems to contradict that idea, but traditional psychophysical testing does not show episodic organization. We therefore suggest that the positive evidence from brain recording methods for conscious experience in MTL may outweigh lesion evidence against it, given the well-established tendency toward cortical reorganization after injury.